Every since I started to use Starfall.com to help my kiddos in learning phonics, I also started to google any website that have similar interactive website for children in learning about Islam. I have found fews, but not that much convincing compare to what I just found recently. It's the baby khalifah series.. I guess some of you must be aware with this series dah kan? Too bad, I'm lil bit late as the series have been in the market since 2010/2011. Yet, takde istilah lewat dalam menuntut ilmu kan..
For the past few days, I was so busied doing research/google about this tools..
As usual, tengok content dia, language used and overall module.. Overall inside the box full of interactive learning activities by baby khalifah series are..
6 interactive cds, 6 workbooks, 1 set of flashcards, 1 bookmark, 1 car sticker and 1 set of colour pencils. This CD set is best used as an educational aid for your 2-4 years old kids. 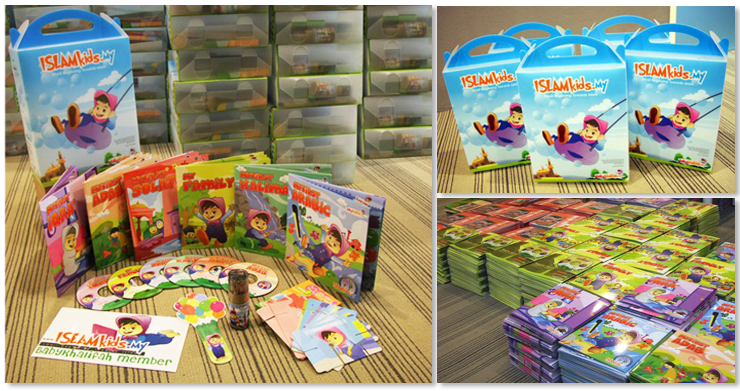 The cute and interactive characters makes learning about Islam and FUN adventure for the Baby Khalifah! Visit this link to get overview of the modules from the demo of the series..
And you may visit this link also to get detail on baby khalifah series.. There's alot of videos about the series have been uploaded in the you-tube, boleh review kat sane jugak.. The difference of watching the series at you tube compare to own these cds for your children, kids not only learn the from the interactive modules, but at the same time there's also workbooks for more effective learning! but i'm looking for minimal of 10 wonderful mommies to share this purchase with me for a special price. The box sale at RM90 each, but I've got special price whenever I purchase above 10 boxes..
Email me at nadya_1901@hotmail.com, I'll give detail about the price.. 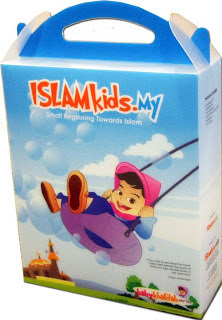 Hurry up, I cannot wait to place order and start to use this to my kiddos..
Hopefully it will benefits them in learning about beautiful of Islam..InsyaAllah! Glad everyone gives good response about this product. InsyaAllah, happy dapat kumpul ramai kawan2 boleh enjoy the benefits and plaing penting beli product ni within the reasonable price. InsyaAllah will submit the first order by tomorrow. I can include u in kalau u nak jgak. Send email to me,I'll gv u detail k.